The Arlandrian: Are new bus shelters coming to Arlandria? shelters might look like. But where will it go? 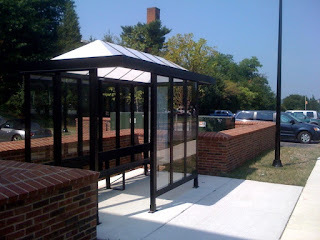 How many bus shelters are there in Arlandria? That was a concern expressed by folks who participated in the planning process that resulted in the 2003 Arlandria Plan. Because there is only 1 along Mt Vernon Avenue between West Glebe and South Glebe. The lonely (and somewhat sad) bus shelter does not make for much of a transit corridor in our heavily used transit neighborhood. As we've noted before on The Arlandrian (Is this a good place for a bus shelter? ), new bus shelters have appeared nearby, but not any that are often frequented (though there are some reports to the contrary). And some upgrades of existing shelters have brought solar power lighting to bus stops. But, by and large, pending redevelopment of some the "opportunity sites" identified by the City in the Arlandria Plan, new bus shelters aren't possible at existing bus stops until the City is granted easements or land to put them on. Have you used this bus stop? Anyone? Still, there are steps in the right direction. It was (gasp) two years ago, that we suggested that Alexandria follow the lead of other nearby communities and consider shelters that provide schedule and route information as well as a place to stay out of the rain and sun. To decide where and when the new amenities will be provided, analysis of ridership data performed for each bus stop during 2010 and 2011 with priorities being set based on a variety of criteria. (See this Metrobus shelter replacement location map). City staff will be available to talk about the design and answer any questions. 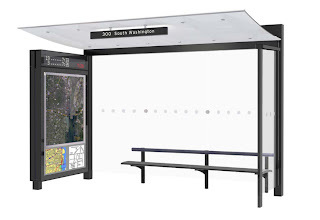 The public will have an opportunity to provide comments on the new bus shelter design during both open house sessions. Check the City website for more information on the Bus Stop Accessibility & Amenities Program. Catch a bus to the presentations if you can. Wish I caught this thread earlier, would have tried to make the meeting. Yes, the Exxon bus stop is sad and in need of an update. The bus stop at MV/Kennedy@ Warwick Village was a very nice upgrade and works well. My ideal bus stop would have 1) adjacent shade trees 2) map or wayfinding w/schedule posted 3) a small amount of bike parking. I have noticed over the years that there is a small amount of bike-to-stop activity, and I think secure locking points are good particularly in slightly less dense areas. I have loosened up regarding #2 above. Cell phones with minimal "smart" features are near upbiquitous, even among lower income people. I can see where maintining maps and schedules could be a pain. But at the very least there should be info on how to access info via your phone posted at the stops. Bill, please follow the link on the post and send your comments to city staff. I think those are excellent observations that they should consider. Also, please note that there's another meeting this evening at Beatley Library. One more additional bit of information that I learned: The replacement shelters are targeted only for the older Metrobus shelters that were installed years ago. The newer shelters that we installed in the last 10 years will remain for the time being. This would include the solar powered bus shelters on the Avenue at Oxford, Kennedy, and West Glebe. Those aren't going anywhere or being upgraded.